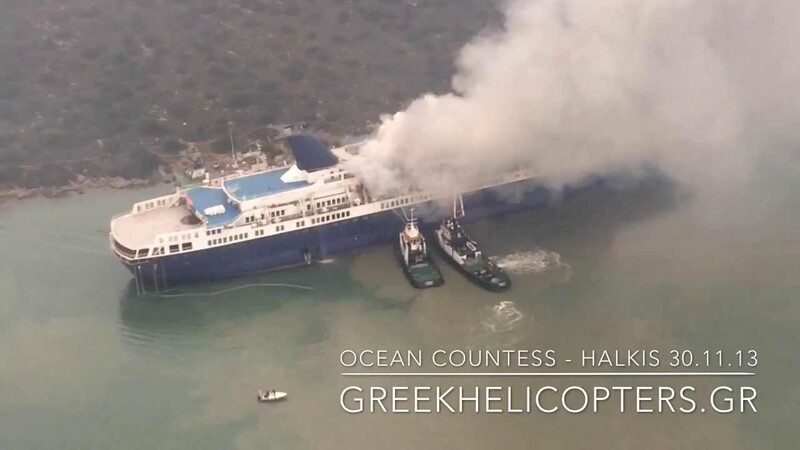 The 17,593 ton former Cunard cruise ship Ocean Countess is on fire while laid up in Chalkis, Greece. As you can see from the Arial footage the blaze is very intense and a planned return to service in 2014 will now surely not happen. At the moment its being reported that it’s unknown how the fire started and thankfully there have been no injuries or fatalities. The Ocean Countess which is currently owned by Majestic International Cruises has been laid up at Chalkis ever since being chartered for Cruise & Martime Voyages in the UK. The ship is well known for being operated by Cunard Line and was built in Denmark then launched in 1976. The ship then left the Cunard fleet in 1996. Since Cunard the ship has been sailing for several different cruise lines and has now ended up with Majestic International Cruises.